Top row: lovely blustery beach walks in Devon, one of my bestest pal's 26th birthday cake, pancakes and bacon for my brother in law's birthday. Middle row: New beach cover up from Topshop - so beautiful. Now I just have to wait for a summer holiday! The colourful Zara coat I am currently lusting after for early Spring, tea served at Taylor Taylor salon in Spitalifields. Bottom row : The much needed Tangle Teezer for my newly dyed locks, new leopard print shoes courtesy of Topshop, and last but not least... my newly obre-d hair! 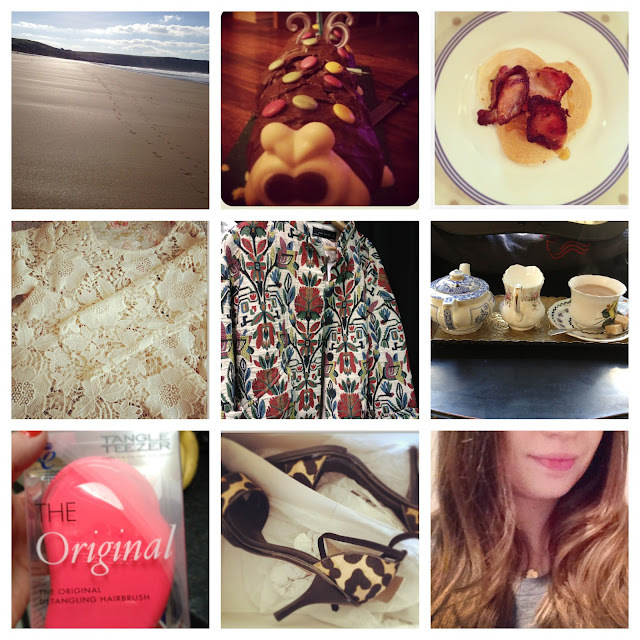 If you should so wish to follow me on Instagram (go on - we'll have a hoot), you'll find me at gonewiththefashion. Your hair looks great! And those shoes are a perfect buy!